When I was three and my father was 30, he built a summer home so our family could spend vacations by the ocean. That’s where we went as soon as school was over, until the day before school started. I loved it. A few years after he built the little two-bedroom home, he added what he called a sun porch onto the south side of the house. It was only big enough to accommodate the four-piece rattan furniture set my parents bought for it. Three walls were windows, it was bright in there all day long, and we could watch cars and people go by. I loved it. A few years later, he built an open porch off the sun porch, stretching the house east, and expanding the living space by the size of an average bedroom. We could watch sailboats glide by, and from our back porch in Connecticut we could see on the horizon another state – New York! I loved it. A few more years went by, and he continued to clear the lot around the house of rocks and boulders common to seaside property. Eventually, all these broken rocks became the foundation and the walls for a terrace. He built it all himself. It stretched across the entire back of the house, and it transformed that little bungalow into what seemed like an estate. This is where we enjoyed clambakes and birthday parties for many years. I loved it. Like most people, I have only happy memories of porches. Does your home for sale have a porch? If so, lucky you! 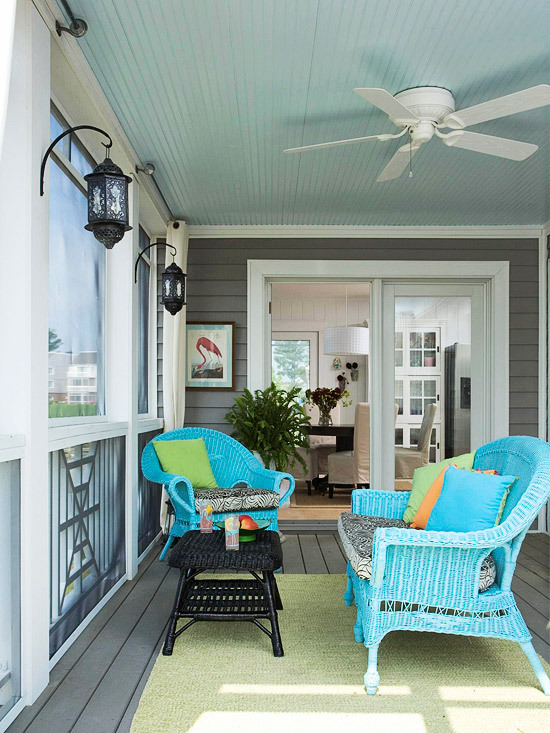 Whether it’s in the front, at the side, or behind a house, a porch makes any structure appear larger, more welcoming, and more connected to the out-of-doors. Or a porch can telegraph buyers that once they buy your home, they’ll have a special place where they can enjoy private time to relax and unwind – everyone’s dream! To other buyers, a porch is a place to entertain. Even a small balcony makes people envision inviting friends over for drinks and conversation, or a meal in the open air. 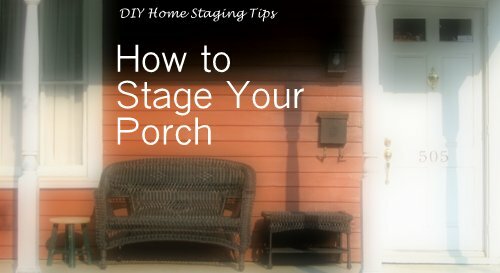 If your home has a porch and you don’t stage it, you’re missing a chance to woo buyers. Here are my favorite porch-prettying pointers. 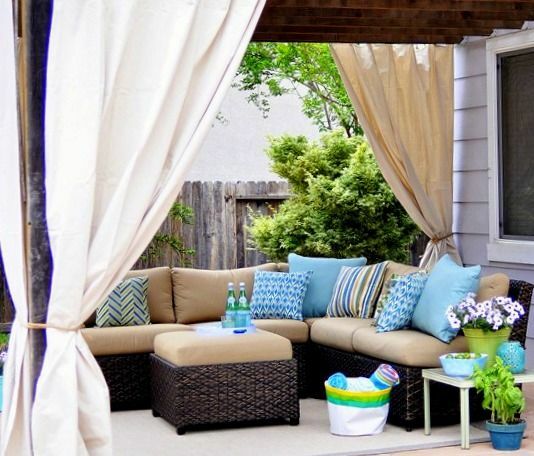 Even though I recommend neutrals inside a staged home, outdoors is a place to punch it up. With brighter natural lighting and less defined boundaries, saturated colors will get the attention you want, making househunters take notice of this amenity. Purchased outdoor furniture gets brighter each year, so you have no excuse for drab curb appeal. If you own older furniture and want to refresh it, spray paint’s probably your best option. I like Krylon's Fushion paint for plastics. If you're painting furniture with a brush, follow the steps I wrote about here: painting furniture. Of course, neutral color, black, or white furniture is timeless, so don't think you need to go crazy with neon spray paint. Your color choices can align with the style of your home and the likely demographics of your typical buyer. If there’s a pleasant view either near or far, make sure buyers notice. Don’t obstruct it with large plants, curtains, or furniture. Position seats so they face the view, because it is not uncommon for Realtors and clients to take a seat and look around, even to linger and discuss the home. If the view from your porch is the battered work van in your neighbor’s driveway, or the brick wall of the building next door, find a way to block it or distract. You can install shutters, blinds, draperies, or add large potted palms. Even if the entire view isn’t totally obscured, you can still make it easy to forget what’s there. This one’s a must. From early spring until late autumn, and year round in some parts of the country, flowering plants on a porch are a classic. 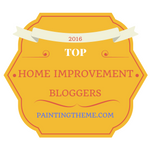 They are the finishing, colorful touches that say a home is loved. You don’t need a horticultural degree to keep most container plants looking good. If the home you are selling is vacant, you get a pass to substitute good quality silk ferns or artificial flowers as long as they don’t look like something from the cemetery. benches, or an old fashioned, cushioned swing like this. Photo: BHG. Whether you have room for just one chair by the door, or for a number of conversation groupings, seats on the porch complete the picture. Make sure there is room to maneuver around them. Face them towards each other or clustered around a table, not in a line as though on display in a furniture store. 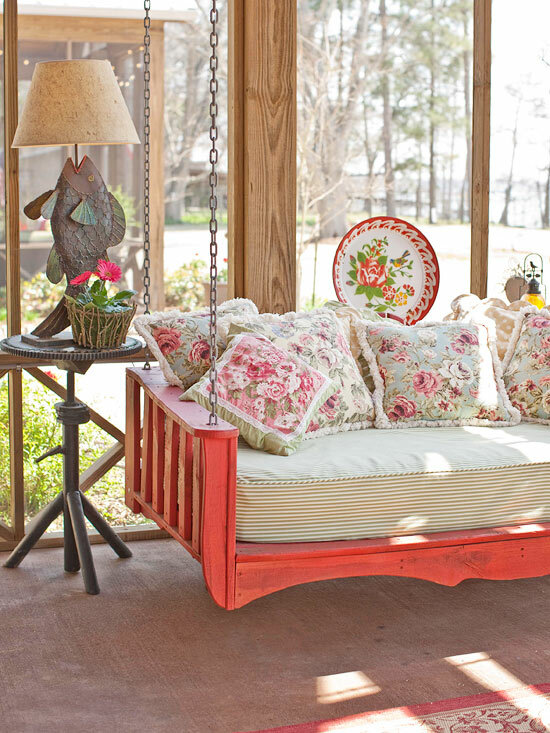 Cushions and pillows are the easy way to add comfort and color to your porch. 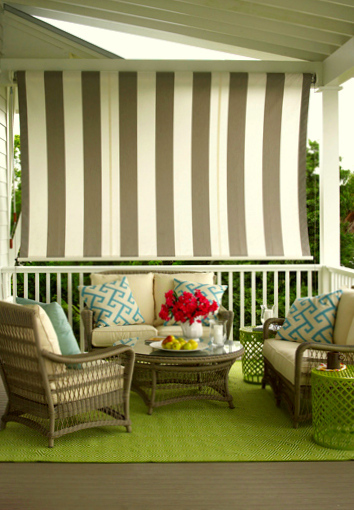 If your porch is protected, or you live where it doesn’t rain all summer, you have all kinds of fabric choices. The rest of us need quick-dry, outdoor fabrics that lessen the likelihood that a buyer will sit down and then leave with a wet bottom and sour mood. No porch? Patios and decks fall into the same category. Even seating groups in the garden can be considered “porches.” Use the reminders above to make any outdoor space inviting to buyers. In fact, even the steps of an inner city brownstone or the small entranceway to a suburban townhouse is an opportunity to add the kinds of touches that make a buyer optimistic about your home’s interior. 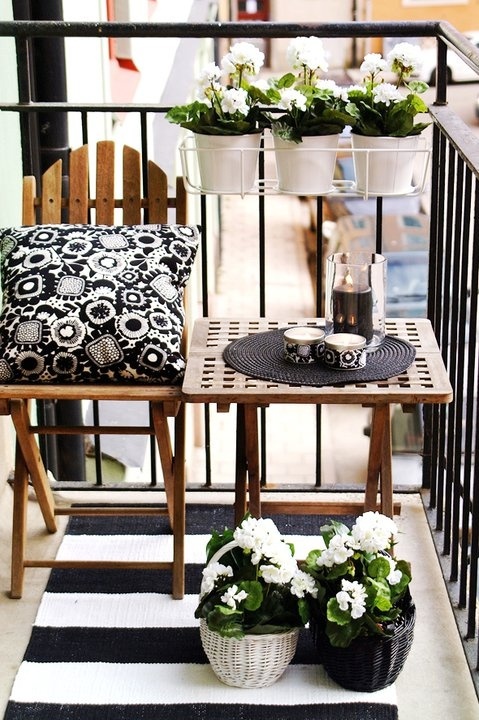 Because potted plants, all-weather carpeting, paint, fabric, and outdoor furniture are available economically everywhere, you’ve no excuse to not maximize your porch’s potential. Now is the time of year to make your porch a statement area of your home. Make your porch tell a story. Stage it to capture the imagination and hearts of buyers, and you’ll be that much closer to a purchase offer. 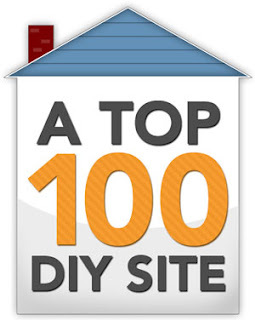 For more help staging your home, order my $4.99 eBook, DIY Home Staging Tips to Sell Your Home Fast and for Top Dollar. I know you'll be pleased. I guarantee it. I'll give you your money back if you're not totally satisfied with what you learn about staging your own home.